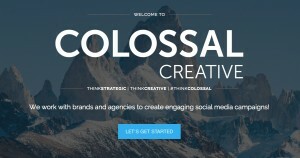 Kieran Edwards, the former head of social at CheethamBell JWT has set up his own agency, Colossal Media. Up until now, it has provided “consultancy, creative ideas and strategy” to major agencies, including WRG. “It's my vision that Colossal will be a leading agency for brands looking to put their products at the forefront of the consumers minds. Our social state of mind means that all ideas and strategies are manufactured to get the most engagement from their relevant social audience,” he told Prolific North. Edwards started out client side, as lead creative and marketing executive at Tesco Opticians, before he was headhunted by CheethamBell, where, over time, he was promoted to head of social. There, he worked on brands including John West and Soreen. “In my opinion,” he continued. “As the social arena continues to grow, many brands will begin to not only increase their spend on social media campaigns, but invest more time in the creative concepts and strategy.